Board the open-top, double-decker bus at any of 37 stops around the city. Then, hop on and off as you wish, or remain aboard for the entire loop. The two routes interconnect, so you can switch between them — your ticket is valid on both. Follow Route 1 (Blue Route) around historical Madrid with its grand royal buildings. Hop off at the Paseo del Prado to visit the magnificent Prado; disembark to explore the Royal Palace, or sit back and admire the Belle Epoque buildings of the Gran Vía, Madrid’s main thoroughfare. 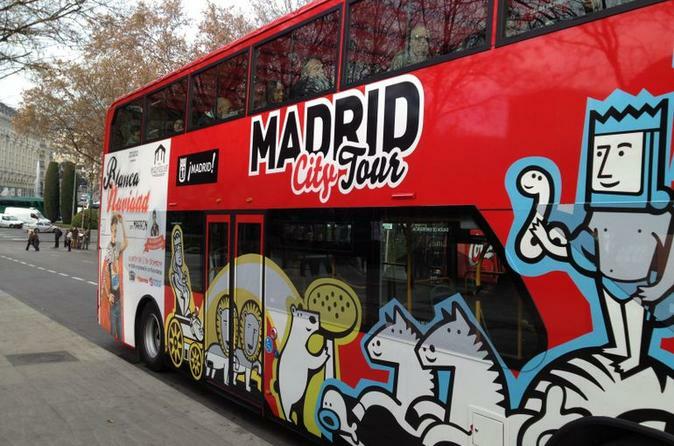 Switch to Route 2 (Green Route) to focus on 19th- and 20th-century Madrid. Delve into elegant Salamanca, Madrid’s first bourgeois enclave; and travel the Paseo de la Castellana past skyscrapers, museums and the legendary Santiago Bernabéu — home to Real Madrid FC.